Bart and Grietje marry on the 28th of May in Harlingen. This is until today the seat of Swijtink Shipping headquarters. Bart is the oldest son of a family of seven children and is nine years of age when he hits the waters for the first time of his life. After marriage, when grandfather Jan resigns and becomes sluice master, the couple decides to set sail on the Elizabeth Jacoba. The vessel of the friesemaatkastje-type measures 31,5 meters by 6 meters wide and has been built on the Appelo Wharf in the village of Zwartsluis. The trade in these years consist of briquettes sailed from the area of Cologne to Leeuwarden over the Rhine river and additional commercial stock for the father of Grietje, who is in sales. During war time, life becomes increasingly difficult. The Elisabeth Jacoba finds herself in hideance in Smitshuis on the Dokkumer Ee in summer 1944 to prevent confiscation for acts of war. The entire family lives on board and the children attend school. In the warm days is father pool attendant for all children from the village, which come by numbers to swim from the ship. Two pigs live in the holds and the family trades oil and coal for milk and other household commodities which have become scarce. They survive winter and are forced to sail to nearby Hoogkerk to unload their coal. Another daughter is born on the day after liberation and the vessel is cleaned to restart business.Later the vessel was lengthened to 38 meters and renamed Jenny. The post-war economic growth appears to stay put and mother and father decide to order a new vessel in cooperation with the wider family. As the original wharf of their choice has more orders than it could handle, the newbuild was done by the Akerboom brothers in the village of Oegstgeest and enters service in 1957 under the name “Vlieland”. The vessel measures 43 meters and is equipped with a 150 horsepower Industrie engine. Mother gets a proper family house with tap water and a true bathroom. 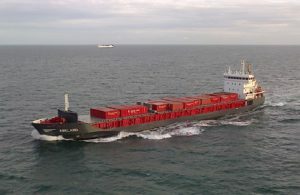 The Vlieland is extended and another vessel enters service: the kempenaar-type vessel “Ameland”, featuring 500 tonnes and a 300 horsepower Brons engine. Two other vessels are run by the family, the Jenny (te old Elizabeth Jacoba lenghtened in 1954 by 7,5m and renamed) and the Secunda. The first car enters the family, a small Fiat. In 1964, newbuild vessel “Terschelling” enters service. The Switijnk fleet enters new trade niches, to Hamburg, shipping dicalciumfosfate and copper in return. As their offspring sails, father and mother start living on the shore in Harlingen and the trades to Hamburg increase. The purchase of the German coaster Edina and the sale of the Terschelling marks the start of cooperation with charterer Wagenborg in the city of Delfzijl. Grandson Stefan Swijtink has grown up and got his time under sail to become captain together with his father Bart once the new “Skylge” is taken into operation in the port of Harlingen in 1991 (78 meters). The engine is powered on 750hp to prevent the obligation to add an engineer to the crew.The voyages along the coast grow in number as far as Finland, as the Skylge is designed with the Saaima Canal in mind. Two new vessels are added to the family fleet in 1994 in the city of Kampen. A new Ameland has been constructed in the Ukraine and finished in Krimpen a/d IJssel, the first with Ice Class 1A and with Stefan as one of the associates. 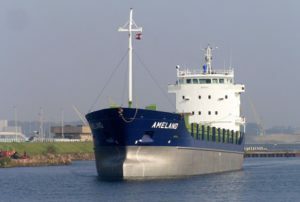 In 2009 the newest Ameland and Skylge are launched in China and are in service now for Finnish charters and sail all year round in heavy ice conditions and long summer days in the baltic. Merchant shipping remains a challenge in the current market. As family business, the Switijnk family has been able to be flexible and adapt and to survive the race to the bottom until today. New generations enter into service and quality, trust and service to clients prove to be ingredients for succes. As sustaining pressure from environmental groups gain ground and lead to the EU discussing limitations for sulphur and carbon emissions, Switijnk Shipping and C-Job partner shortly in the EU Interreg B North Sea Region project SAIL. As public efforts to re-introduce sailing merchant ships fail, C-Job elaborated on another type of hybrid thrust: the Flettner rotor. Finnish startup company Norsepower succeeds in the commercial introduction of flettner rotors and Switijnk Shipping slowly moves to embrace the FF8500 concept of a first generation Flettner Freighter hoped to be developed in the near future.